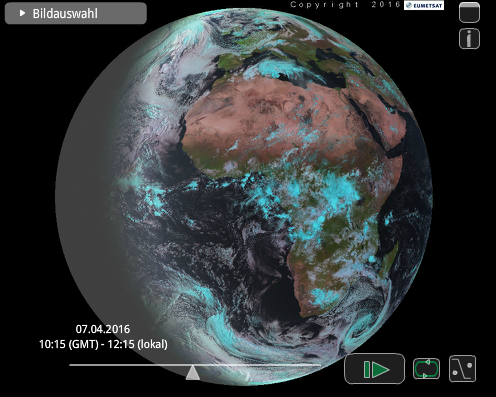 Click on the picture to launch MeteoViewer, an interactive tool that displays the latest images taken by the European Weather Satellite Meteosat-10 (MSG). ZFL operates a MSG receiving station. Every 15-min we receive all channels in full resolution of the reprocessed data by EUMETSAT archive various subsets of Africa and central Europe for research on cloud distribution and rainfall modelling. Current subsets stored comprise southern Africa, East Africa, West Africa and central Europe.